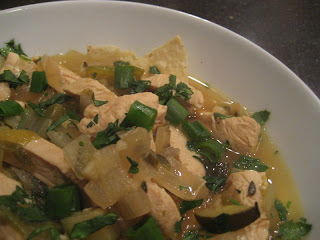 This Mean Green Chicken Tortilla Stoup from the November 2006 issue of Every Day with Rachael Ray is perfect when you have been eating bad food for about a week and you decide that it's really time to clean up your act. Now, I know there are tortilla chips and cheese in this recipe, but other than that, it's all veggies and healthy yumminess. This recipe serves 4 and it was all gone by the next night (there's only two of us). 1. In a large soup pot, heat the EVOO, 2 turns of the pan, over medium-high heat. Add the tomatillos, zucchini, onion, jalapeños and garlic and season with the cumin and salt and pepper. [Gotta love the chop and drop. Saves time if you just chop and drop as you go instead of chopping it all then adding them all at once. However, if you chop really slow, waiting till it's all chopped is a better idea.] Cook until the onion is softened and the tomatillos become saucelike, 7 to 8 minutes. Add the beer and cook over high heat until reduced by half, about 5 minutes. Add the chicken broth and thyme, cover and bring to a boil. Stir in the chicken and cook at a low boil for about 6 minutes. Discard the thyme stems (the leaves will have fallen into the stoup). Season with salt and pepper. It looks delicious! Thanks for sharing the recipe. You are welcome, Caitlyn. I hope you give it a try!